A. Hard water is the most common problem found in the average home. Hard water is typically defined as water having more than 1 GPG (grains per gallon) of dissolved minerals in it, generally consisting of calcium, magnesium carbonate, and/or manganese. The amount of hardness in water is usually measured in GPG (grains per gallon). A couple of ways for you to find out how hard your water is, would be to have it tested at a local water testing laboratory, or you can schedule an appointment with us, and we can come out and perform an on-site analysis, normally at no cost to you. We will test your sample for hardness, chlorine, and pH, etc..
Q. Why soften my water? A. Soft water greatly reduces the scaling of pipes, faucets, and bath fixtures, and reduces spotting of glasses, dishes and flatware. Soft water also helps detergent clean your clothes better, while making your clothes last longer too! Q. Why should hard water concern me? A. For many uses, it would not matter. For instance, to control or extinguish fires, irrigation, or wash the mud off your driveway, water would have to be pretty hard to cause problems. But for bathing, washing dishes and clothes, shaving, washing your car and many other uses of water, hard water is not as efficient or convenient as "soft water." For instance, you typically use only half as much soap cleaning with soft water because hard water and soap combine to form "soap scum" that can't be rinsed off, forming a bathtub ring on all surfaces and dries leaving unsightly spots on your dishes. When hard water is heated, the hardness minerals are re-crystallized to form hardness scale. This scale can plug your pipes and water heater, causing premature failure, necessitating costly replacement. Soap scum remains on your skin even after rinsing, clogging the pores of your skin and coating every hair on your body. This crud can serve as a home for bacteria, causing diaper rash, minor skin irritation and skin that continually itches. In some cases softened water has controlled the effects of eczema. For many industrial uses, the hardness minerals interfere with the process, causing an inferior product. Q. Why do water softeners add salt to the water? A. The softener operates using an "ion exchange" process. When hard water contacts the cation resin beads, by passing through the softener mineral tank which have soft sodium/potassium ions attached to them, an ion exchange process takes place with the hard mineral ions, (normally calcium and/or magnesium), and during this contact, simply trade places with the soft sodium/potassium ions. At this point, the resin then needs to be regenerated with new sodium ions, so the resin will again be able to exchange the hard for the soft. Salt, or sodium chloride, rinses through the resin beads during the regeneration of the softener, and washes the hard water ions off of the resin beads replacing them with new sodium ions. A. That depends on the hardness of the water entering the softener. Below is a simple chart which shows the additional amount of sodium you would consume by drinking one quart (32oz) of softened water. As you can see, for water 20 grains hard you only have 150 milligrams per quart of water in sodium added which is less than one slice of regular white bread! Q. Do I have to use salt in my softener? A. No. Most stores that sell softener salt also sell a water softener salt substitute called potassium chloride. The potassium chloride for softeners is just as effective as regular softener salt but adds potassium instead of sodium. The cost of potassium chloride is a little more than regular softener salt but well worth the small increase if you have concerns about residual sodium in your water. Call and check the availability of potassium chloride and the difference in price, compared to softener salt, in your area. Q. Is there any concern about corrosion from the salt in the water? Q. What do you think about Magnetic Water Conditioners? A. Magnetic water conditioning units have been available for several years and are not a new product. We have researched these products and have yet to find any non-biased, scientific proof that confirms this form of water treatment as being effective. Basically, the claim is that these units change the electric charge of the hard water mineral molecules that are dissolved in the water. By supposedly changing the electric charge of the molecules, this causes the hard water minerals not to "stick" to whatever it comes in contact with, such as pipes, water heating elements, bath fixtures and faucets. As these units do not remove any minerals that cause hard water stains and buildup, we do not endorse any brand of magnetic conditioner. In addition and in our opinion, and based on years of independent research and articles disavowing this type of "water treatment", we highly recommend that the wise customer should beware of any company that markets these type of units. Q. Will your water softener remove iron from my water? A. Our softeners will remove certain types of iron from water. There are several types of iron found in water. If it is a soluble iron, commonly known as ferrous iron, and is not more than 0.3 ppm(Maximum Contaminate Level), then in most cases it will remove it from your water. Other forms of iron, such as ferric iron requires the installation of a separate "iron filter" which looks very similar to a softener without the salt or brine tank. These iron filters generally have a timer and valve unit that are pre-set to backwash their special iron removing media as needed. Q. I have a water softener and now my water feels slimy! A. When the hardness minerals are removed, soap no longer forms a soap curd, or "bathtub ring" on your skin, plugging your pores, clinging to every strand of hair. You are now truly clean. That slick, slimy feeling you feel is your natural body oils without the soap scum. The old saying that you get "squeaky clean" is a myth. That feeling was caused by the soap scum on your skin. By the way, that soap scum also provided an excellent place for bacteria to hide and grow, causing numerous minor skin ailments. This “slimy” feeling can be reduced by mixing back in a small amount of “hard” water reducing the feeling that soft water typically gives. 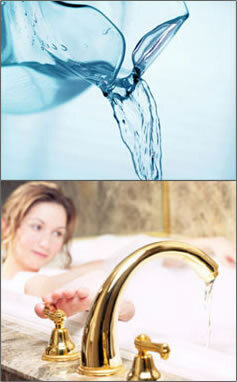 In most cases, customers get used to “soft” water and generally prefer it.